Lt. Wilbur Brean, 23, was killed in action on May 27, 1944, while on a mission with the 96th Bombardment Group of the 8th Air Force. He had been listed as MIA during the Normandy Invasion of Fortress Europe. He was buried Sept. 20, 1950, in a group burial plot at Zachary Taylor National Cemetery, Louisville, Jefferson County, Kentucky. Brean lived at 83 Tappan Avenue, Belleville, N.J., with his parents Martin and Gertrude, and sister Marjorie. His family attended services at Bethany Lutheran Church. Lt. Brean and his crew were assigned to the 338th Squadron, 96th Bomb Group in May 1944. The crew were listed MIA on 27th May 1944, when their aircraft B-17G, Serial 42-102475, coded BX-?, 338th Squadron was in collision with B-17 42-102561, AW-D from the 337th Squadron, 96th BG, piloted by Lt. Charles Irving. The two aircraft were part of four 96th BG which collided while avoiding flak on the mission that day. The formation was about five minutes from the target at Karlsruhe, Germany, when the collision occurred and the aircraft broke in two at the radio room and crashed north of Stein, near Pforzheim, Germany, at 1300 hours. Seven crewmen were killed and three survived and became POWs. 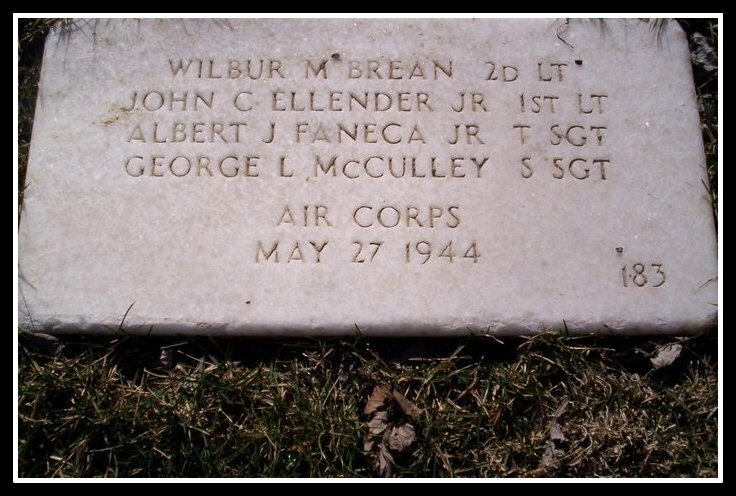 Lt. Brean, Radio operator, Ball gunner, and Tail gunner were identified and were buried with three unknown airmen in the local cemetery at Stein. All the bodies were later reinterred in the American Cemetery at Lorraine where the ball gunner and tail gunner still remain. Two other bodies were returned to New Jersey, the navigator and radio operator respectively and the other three, Lt. Brean, bombardier, and engineer received a group burial in Zachary Taylor National Cemetery, Louisville, Kentucky. In the other aircraft involved in the collision six were killed and four POW.